Kaya Elders support Uhuru Kenyatta, denounce Raila Odinga support. - Kennedy Kamto - Bana Kenya News, Real African Network Tubanane. The Coast Mijikenda Kaya elders from Kwale and Rabai sub-communities have particularly denounced the mega rally set for Mombasa on Sunday "as it could lead to bloodshed". Speaking in Mombasa, the Kaya elders said that people should not be used by politicians. "We do not want demonstrations or violence in the Coast," Sefu Bundwao, a Kaya elder from Rabai, said. "As elders, we are against any form of demonstrations. We are ready to take part in the repeat polls to re-elect President Uhuru Kenyatta." one of the elders said. He addressed a press conference at Moffat Hotel in Mombasa on Friday, after Mvita MP Abdulswamad Nassir declared the protest will take place. Bundwao said the bloodshed witnessed across the country is uncalled for as wananchi are the ones suffering. "Coast region has always been peaceful but this could change if NASA leaders organize demonstrations against IEBC." "We want peace. The economy has been affected...we are ready to vote on October 26 and want to see peaceful elections. We do not want to hear of any violence," Amina Abdala Hamisi said. Nguma Charo, chairman of Pwani youth Task Association in Kisauni, said is being witnessed in Kisumu, Nairobi and other parts of the country should not happen at the Coast. "Coast has been peaceful...leaders cannot come here and use youths to demonstrate. People are ready for the election. Those from Nairobi should come and attend the rally peacefully, not cause violence." The elders said they will send former Kilifi Deputy Governor Kennedy Kamto to the President and DP William Ruto so he can arrange their meeting. The Kaya meeting comes just a week after another group of Kaya elders said they did not recognize Jubilee and vowed to support Raila Odinga in his bid for presidency claiming that the only way to rescue coast from the Government poachers is by changing the leadership. 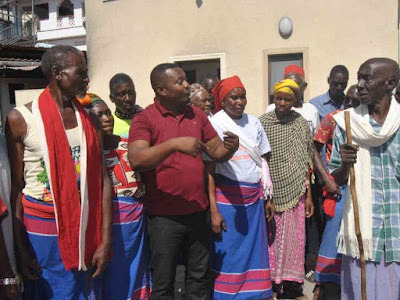 The former Kilifi deputy Kennedy Kamto who is also the deputy/running mate for the Jubilee Kilifi gubernatorial Candidate Gideon Mung'aro has been allegedly paid and forced the elders to denounce the last weeks Kaya elders speech.